A journey that has been some time in the planning comes to fruition. 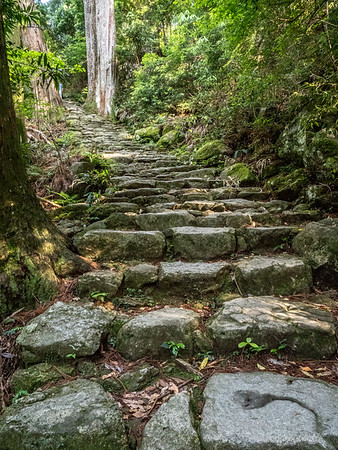 For some years now, I have thought about hiking the Kumano Kodo; a network of ancient Shinto pilgrimage trails in the Kii Peninsula of Wakayama Prefecture of Japan that connect the three Shinto Grand Shrines – Hongu Taisha, Hayatama Taisha and Nachi Taisha, collectively called the ‘Kumano Sanzan’. The region is thought to be the mythical holy ground where the gods dwell. This pilgrimage has been described as ‘a journey for the soul’ and that certainly turned out to be true. It was to the spiritual heart of Wakayama Prefecture that my sister and I travelled. We started our journey in Mt Koya. We were met by our guide, Kanako, a bubbly, cheerful young lady who said if we had difficulty remembering her name, just remember ‘Can of coke’! We didn’t need the mnemonic but it stuck! Our first stop, straight from the Osaka airport was to a world heritage site (we were to see many of these) – the Niutsuhime-jinja Shrine. 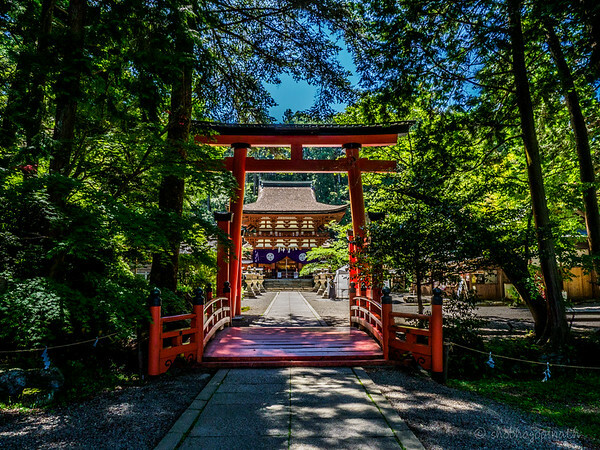 The deities of this shrine are the protectors of the Koyasan region and for that reason an important starting point, but is often overlooked because it is out of the way. 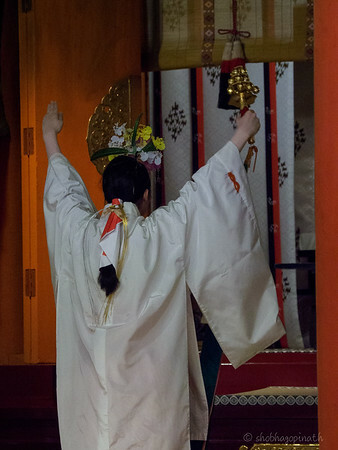 Kanako introduced us to the basics of Shintoism and more importantly taught us the rituals of a pilgrim at a shrine. 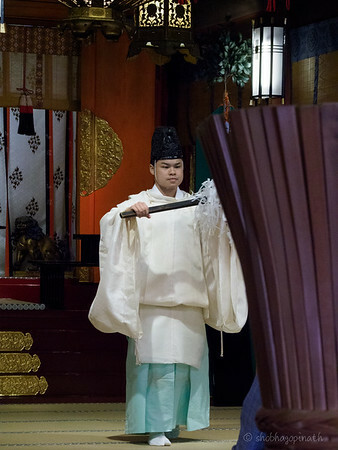 Before entering the shrine, one must purify oneself in a ritual known as ‘harai’. 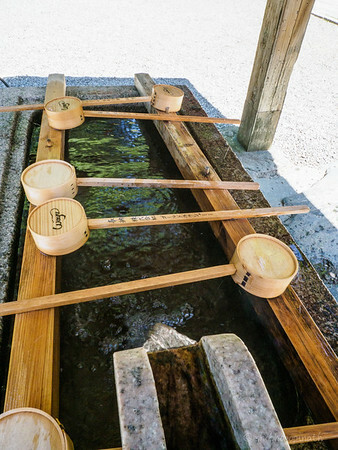 All shinto shrines have a tank of water with long-ladled scoops called ‘temizuya’ and the ritual goes like this – you scoop a cup of water, wash your left hand, then your right hand, then cup some water on your left hand to wash your mouth and then wash your left hand again and hold the ladle upright to drain any remaining water. Having done that, you may now enter the shrine. Before entering, you must bow and walk along the sides, never on the centre which is reserved for the spirits. (We were quite sure to stay on the sides). 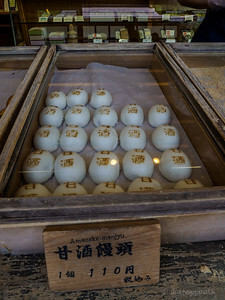 At the main shrine, offer a coin, usually a go-en (5 yen coin) because it sounds like ‘good relationship’ (ie. a good relationship with God), pull the rope to ring the bell, bow twice, clap your hands twice, then close your eyes and pray. Once you are done, bow once and retreat. 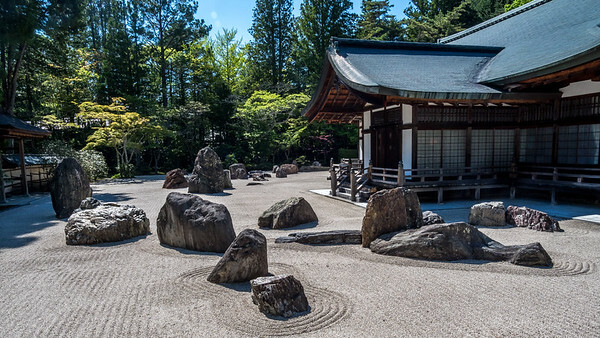 It was about a thousand years ago that the Buddhist monk Kukai (also called the revered Kobo Daishi) made his way to Mt Koya and established the Shingon Buddhism that is still practiced in Japan today. 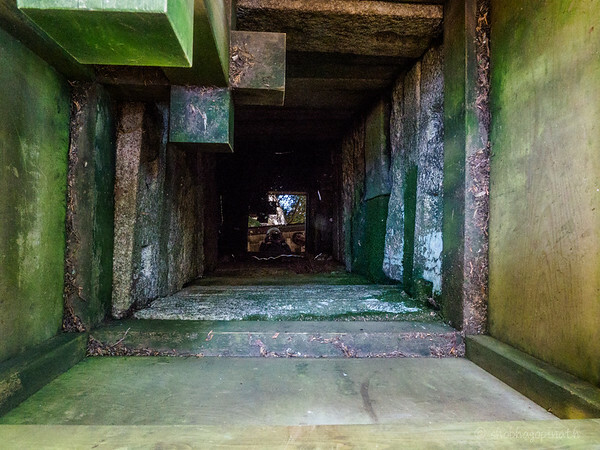 It was to this shrine that Kobo Daishi first came and was guided by two dogs to Mt Koya where he established his Buddhist centre. Since then Buddhism and Shintoism have resided side by side all through the centuries peaceably. 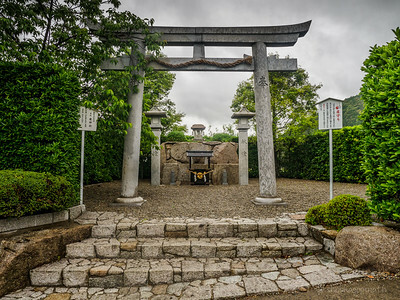 Shinto shrines and Buddhist temples are often located adjacent to each other. 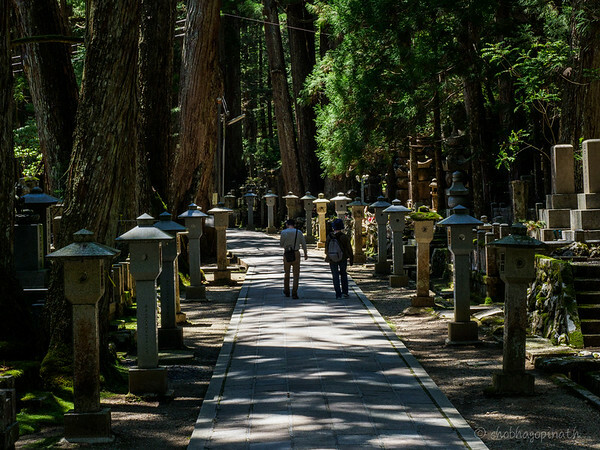 After a simple tonkatsu lunch at a small restaurant nearby, we set off to Mt Koya town centre and the renowned Okunoin Cemetery. 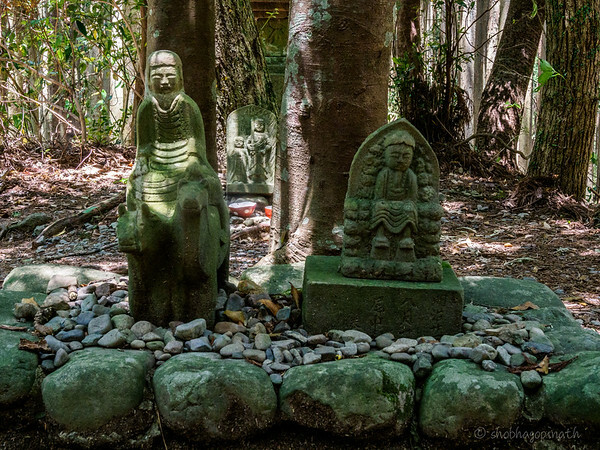 The Okunoin cemetery, considered one of the most sacred places in Japan, is the site of the mausoleum of Kobo Daishi. Kobo Daishi is believed to be in eternal meditation as he awaits the Buddha of the Future. 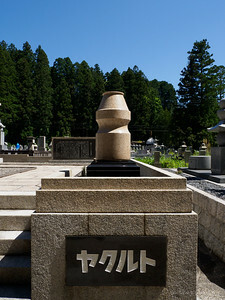 The walk through the cemetery has been described as ‘A Walk Among Waiting Souls’ because wishing to attain salvation with Kobo Daishi’s intercession, many people, from prominent monks to feudal lords, even corporations such as Panasonic, Sharp, Yakult etc have tombstones erected here. Kanako told us of a pest control corporation having erected a gravesite here for the ‘salvation and comfort’ of the souls of the pests they have had to eradicate. At the entrance of the cemetery was a tent under which some ladies were serving green tea and snacks. We went to ask what was going on and were told that they were volunteers serving tea and snacks to pilgrims and gestured for us to sit and have some. And so we did and got to chatting with two other Japanese ladies who spoke English rather fluently. One of them was an avid hiker and told us stories of her hikes around the world. I was wide-eyed and agog. 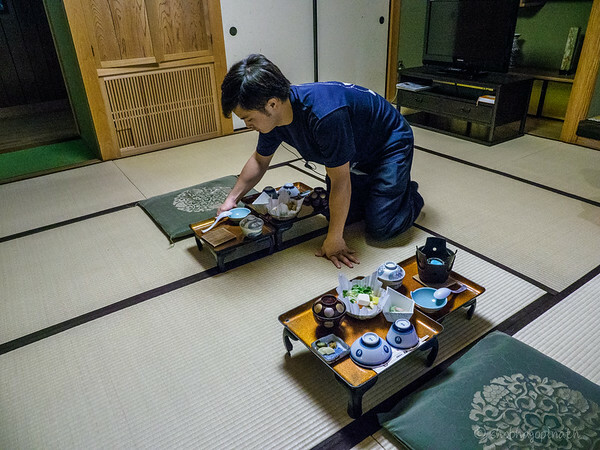 They also explained that the tea and snacks are only served on special days and that we had come on a special day. The 21st of every month is considered very spiritual as it was on a 21st that Kobo Dashi closed his doors and went into isolation and eternal meditation. The cemetery is vast with more than 200,000 graves and ancient mausoleums, some very grand, many not. 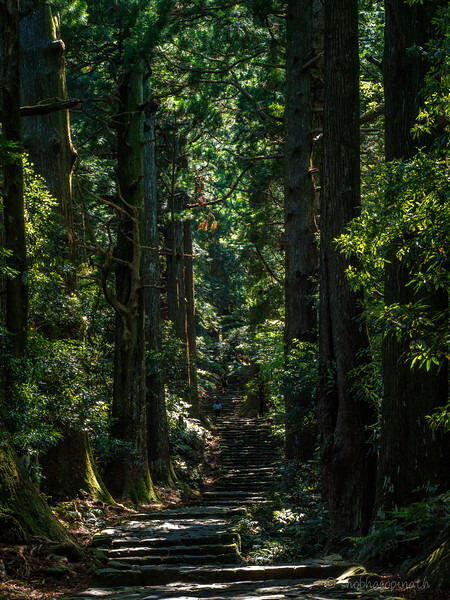 The path to Kobo Daishi’s mausoleum was 2km long and it was such a beautiful walk among magnificent and lush cypress, cedar and pine trees. The dappled path was far from creepy, it actually felt peaceful. As we walked along among the moss-covered tombs, my sister and I sang (in low voices) the Japanese songs that our mother had taught us. This surprised Kanako and she gleefully sang along with us. We grew up hearing these songs from our mother. She taught us, then her grandchildren and now she is teaching her great-grandchildren! The great thing is we now know what the songs mean and the proper pronunciation! Our mother had to learn these during the Japanese Occupation. One was a patriotic song about the Japanese flag and the other a ditty about a reluctant snail. What surprised us was Kanako’s reaction when I’d said that our mother learnt it during the Occupation of Malaya. She stopped in her tracks and apologised. It was heartfelt and sincere – not that her generation had anything to do with the war. We hadn’t expected that. She said for a long time there was deep shame among the Japanese for the things they committed during the war but now – her generation is learning to be proud of their culture and country again. 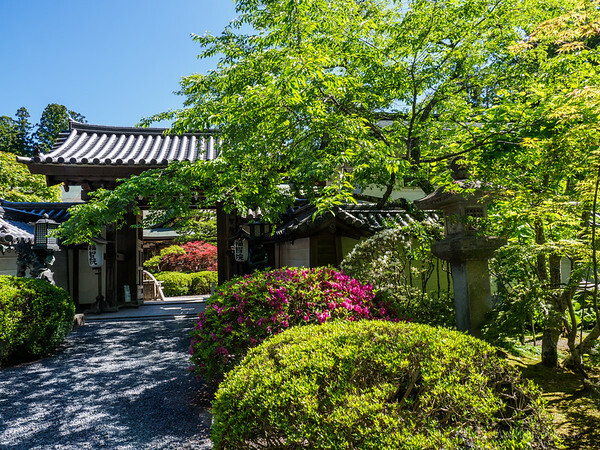 We walked through the cemetery to the Lantern Hall and to Kobo Daishi’s mausoleum where he closed the door and went into eternal meditation. All we could see was the closed door. No photography was allowed of the mausoleum or the area around it. After the cemetery visit, we walked some more to see the Kongobuji Temple and an ancient pagoda nearby and continued our walk around the town. During our walkabouts we asked Kanako if she had heard of ‘Shintaro’ – a late 60’s/early 70’s TV programme that we used to watch as children. She had to look it up and laughed uncontrollably as she learnt it was a tv show in black and white and said she would have to ask her mother. She was oh-so impressed that there were Japanese TV shows in Malaysia that long ago. We said the reason we remember it is because the hero was terribly handsome. She found the whole thing hilarious and her infectious laughter had us laughing along too. We stopped for more green tea and snacks but this time at a teahouse. 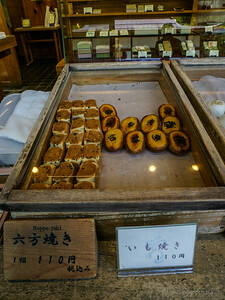 Japanese desserts are simply the most delicious and we had too much of them on this trip (my travel companion would beg to differ I’m sure). We said our farewells to the lovely Kanako and our driver and checked into the Fukuchiin monastery for the night. Many monasteries provide accommodation and food for pilgrims. We were really looking forward to experiencing our first ever stay in a monastery. We had to remove our shoes and leave them in racks outside the entrance. 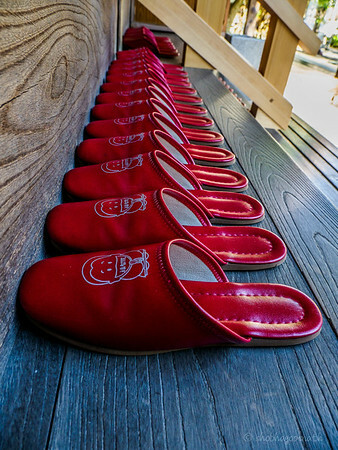 Indoor slippers were provided. The attendants were either monks or students from Mt Koya University who helped out. We were shown around by a young man – who cautioned us to note the colour of the curtains outside the onsen – red for women and blue for men. It would be quite disastrous, not to mention embarrassing, if we got that wrong! We were provided yukatas (cotton kimonos) for use during our stay. All the guests wore yukatas as they ambled around the monastery and so did we. We had our first experience of a Japanese onsen. I had read up on onsen etiquette and procedure, the do’s and dont’s. I had friends helpfully heap more information. You can’t enter an onsen if you have tattoos for example or you might be thought of as being part of the Yakuza! And since I don’t have any dragon tattoos anywhere on me, I’m safe! … radiotherapy tattoos are exempt as they are way too tiny! Without too much further discussion, my sister and I took a deep breath and parted the red curtains and entered the ladies’ onsen. Thinking about it was worse than the actual process. It turned out to be quite pleasant and relaxing. We lost our inhibitions fairly quickly and even chatted with the other ladies in the onsen. Being a monastery, dinner was a very vegetarian affair which was served to us in our room, which was a traditional Japanese room with tatami mats. The food was simple and delicious. Once dinner was done and cleared, our futons were brought out and made. We didn’t realise how tired we were till we saw the futons – we had taken a 1am flight the previous day and not rested since we landed. So it was an early night for us. Our day began early. We were to join in the morning prayers at 6am but we overslept and had to quietly creep into the prayer hall 20mins late only to find it full and had to sit by the door. The chanting went on till 7am. The monotony of the chant was rather soothing. When it ended, we circumambulated the prayer hall as we exited and back to our room for breakfast. 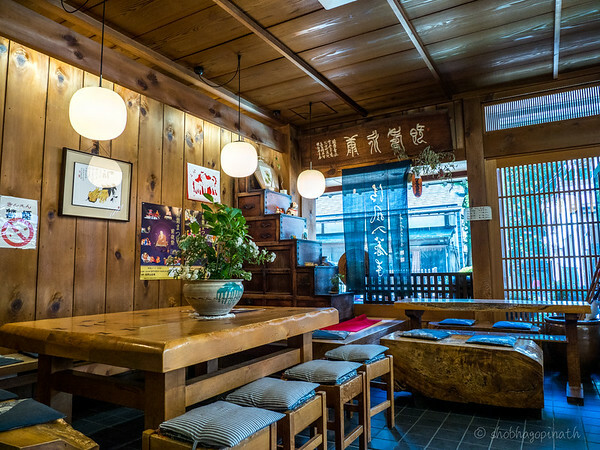 Japanese breakfast is like lunch – rice and dishes and soup. As no coffee was served with breakfast, we went in search of coffee. Japanese coffee by the way is excellent. We found a common area where there were a few people mingling, evidently also come looking for coffee. There were a few Europeans and many Japanese. Coffee is an extra and was not free but it was so good. We sat in front of the pristine manicured garden and sipped our coffee as we wondered whether we had brought sufficient warm clothing. It was so cold that morning, that even the Scandinavians were wearing down jackets and we had just brought light jackets! 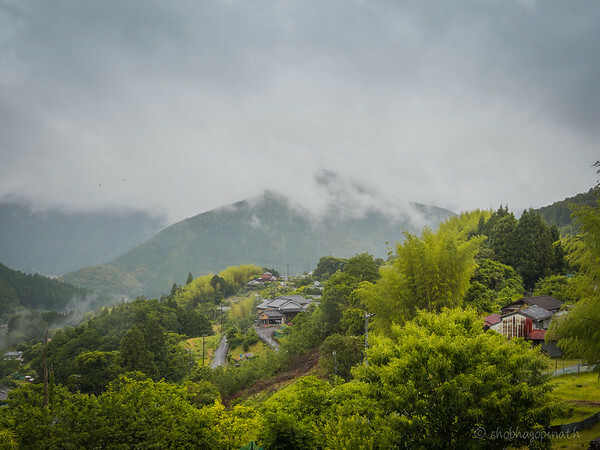 Weather forecasts didn’t say it would be 4 degrees C.
We checked out and very excitedly looked forward to the next part of our journey – the Kumano Kodo. 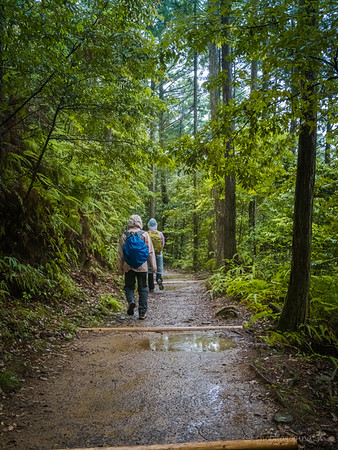 It has been written that the Kumano is the world’s ‘best unknown hike’ although pilgrims in Japan have been walking the routes for more than a thousand years. Kumano’ means ‘the edge’ (as in the edge of this world and the spiritual world) and ‘Kodo’ means ‘road or path’. We took the Nakahechi or Imperial Route. The ancient court of the Emperor and the aristocrats took this route and it was in those days a 30-40 day journey. We didn’t hike the entire route (but now wish we had) but chose sections of it covering the main ojis (small shrines) and the three grand shrines. So instead of hiking from Mt Koya, we took a taxi to a point on the Nakahechi route. The car journey took 2 hours. We were met at our starting point by our Kumano walking guide (they need to be specially certified to guide in the Kumano Kodo). The best companions are those who know to keep the same silences. My sister and I know each other so well that when we weren’t keeping our silence, we finished each other’s sentences and voiced the other’s thoughts before the words formed. Such is our relationship. We are at complete ease with each other. So it was with some apprehension that we agreed to a guided walk not knowing what the guide would be like. We were very lucky in Waka. She was a pleasant and lovely person to hike with. She knew when to chat and when to keep the silence and she was a wealth of information – which is why we chose a guided walk instead of a self-guided one. She filled us with stories and folklore as we hiked. There’s a poem by Thomas A. Clark called ‘In Praise of Walking’ and there’s line that says “In the course of a walk, we usually find out something about our companion, and this is true even when we travel alone”. Hiking for me has always been therapeutic. (“Hiking is the answer. Who cares what the question is!” – heard that one?). We each, for various reasons, needed to ‘find our slow’ and what better way than to go on a long multi-day hike. Ours was a three day hike – an immensely shortened route given our time constraints. It turned out to be a pleasant morning and not as cold as it was in Mt Koya and our attire was quite sufficient. The start of the trail was relatively easy and we really took our time. The forest was beyond beautiful. Such serenity and peace. 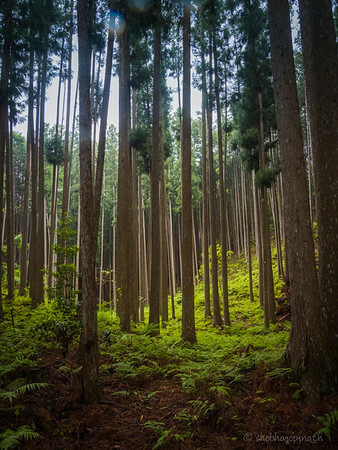 Ancient cedars, pines, bamboo and cypress whispered as the wind blew through them. 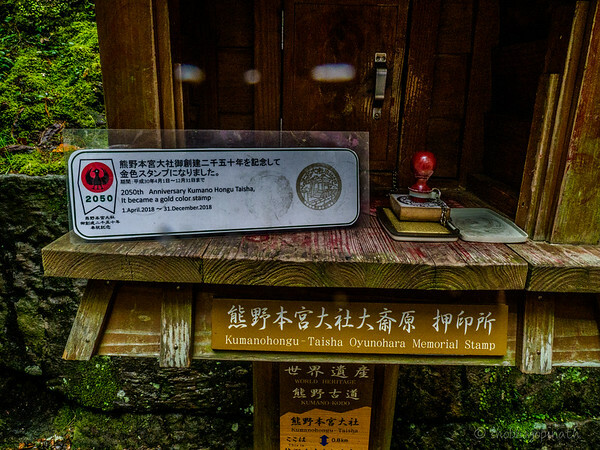 We stopped at all the shrines along the way and as we walked we also collected the stamps to show the path we had taken. There are only two Unesco trails in the world – The Camino de Santiago in Spain and Kumano Kodo in Japan. At the start we were given a booklet to collect the stamps – one side for Kumano Kodo and the other side for Camino de Santiago. Once you have walked both trails and filled both sides of the booklet, you are eligible to register as a ‘dual pilgrim’. The first significant statue we came across was that of Gyuba doji. It is believed that the 17 year old Emperor Kazan, was out-manouevered politically by the powerful nobles of his court and was exiled. It is thought that he was the first Emperor to have made the pilgrimage to Kumano Kodo. He is depicted straddling a horse and a cow and was called Gyuba-doji ever since – ‘gyu’ means cow, ‘ba’ means horse and ‘doji’ means child. This later came to be the symbol of Kumano Kodo. 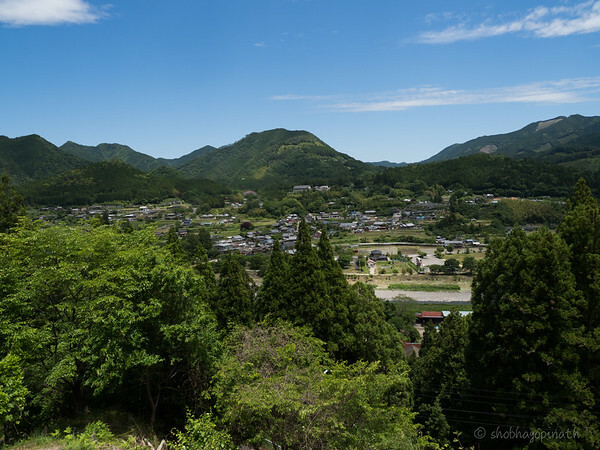 After a couple of hours, we came upon the village of Chikatsuyu nestled in a valley. It was rather surreal that this village in the mountain had an art museum and we decided to detour and take in the local art. On display were paintings by some famous Japanese painters from the region. We then stopped at a lovely restaurant where they served what can best be described as western-style food with a Japanese twist! Slightly surprising to find such cuisine up in the mountain! We enjoyed the meal very much. We continued on – passing paddy fields, farms, small plantations and into the forest again. Many pilgrims and hikers have got lost in the forest taking the wrong path. 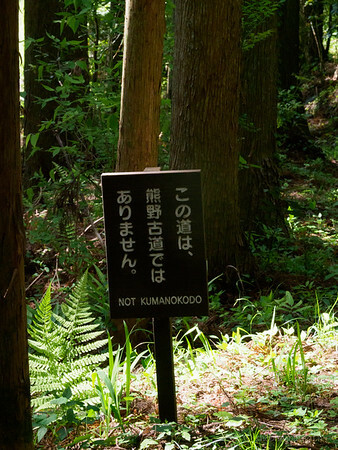 The authorities have helpfully put up signs saying ‘Not Kumano Kodo’. Even with these signs many still find they have hiked down the wrong path realising it only hours later and have had to back-track! As beautiful and tranquil as the forest is, you really do not want to be stranded in there at nightfall. Snakes and hornets are a particular danger on the trail. 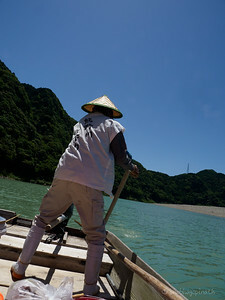 I have seen photos of people hiking the Kumano with nets on their heads to protect themselves from hornets. We didn’t have such cover and just hoped for the best! There’s no real protection from snakes so that required another prayer! And speaking of signs – we only came across one sign for the toilet and it was in Japanese! It wouldn’t have helped us at all had we been on our own. Furthermore, the sign was 1 km away from the said toilet and there were no signs after that! There were small quiet villages on the mountain. We greeted and bowed as we passed villagers who sat at their doorstep shooting the breeze. Needless to say there was much bowing and polite greetings all through our trip. We knew enough Japanese to meet and greet and Waka taught us a few more phrases. We stopped for the day by a waterfall and in the evening we checked into a very nice ryokan in the Kawayu Onsen area. 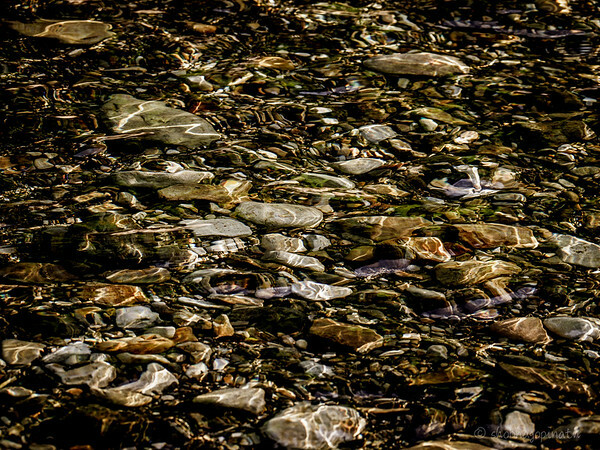 There was a crystal clear river flowing by it. It was so lovely, that after checking in, we decided to go for another walk along and down the road. Such loveliness. We got back to our Japanese-style room and we were thrilled that this time we had a private outdoor onsen. A hot bath at the end of a long day of walking was immensely relaxing. Fresh and clean in our yukatas, we met Waka for dinner downstairs. She also showed us the proper way to tie the yukata:-) Dinner was an elaborate affair of many courses. So many dishes were new to us and my food enthusiast sister was in heaven. We quickly got used to sleeping on the floor and actually found the futons rather comfortable. We woke up to a steady rain and once again enjoyed our outdoor hot bath while watching birds flying by and the rain showers cooling things down further. The Japanese breakfast filled us up for the day’s hike. There would be no restaurants today as we would be up high up in the mountains. 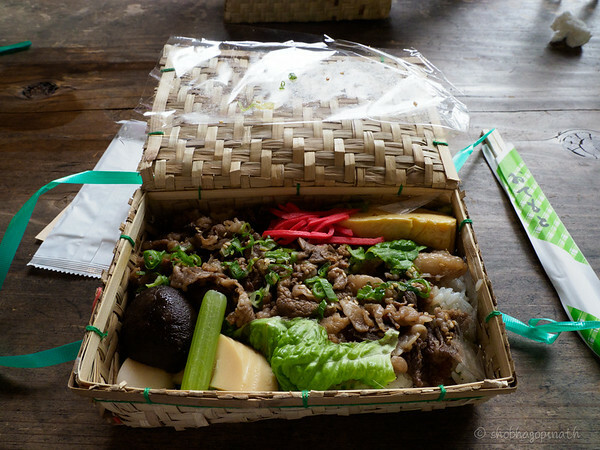 We packed a bento lunch and set off first to a quaint little village called Yunomine Onsen. 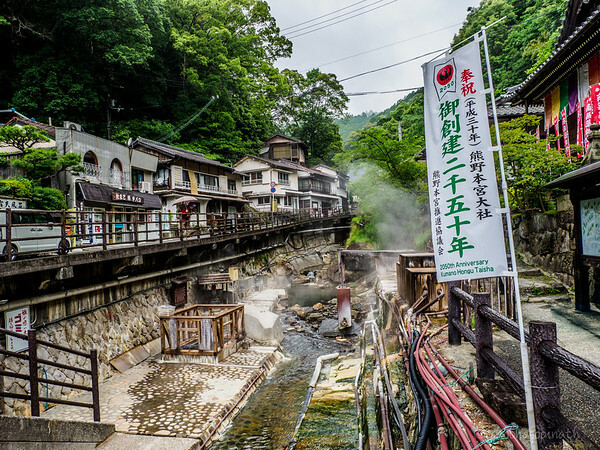 The onsen here was discovered 1800 years ago and is supposed to have healing powers. Yunomine means ‘hole in the chest’. It is said that the hot spring gushed out of the chest of the statue of the Buddha of Medicine and Healing which was found here all those years ago. A strong smell of sulphur hung in the air. We were there quite early so the village wasn’t quite awake yet but a small sundry shop was open. 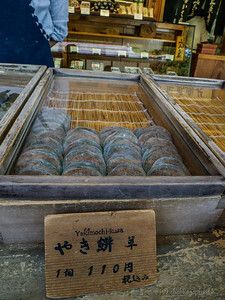 Waka went to buy some eggs, which came in a net, to make cooking them in the hot spring easy. We walked around while our eggs cooked and Waka and I promptly sat by the side of the hot springs, cracked our eggs and dipped it in the salt and pepper that Waka thoughtfully brought along and ate. 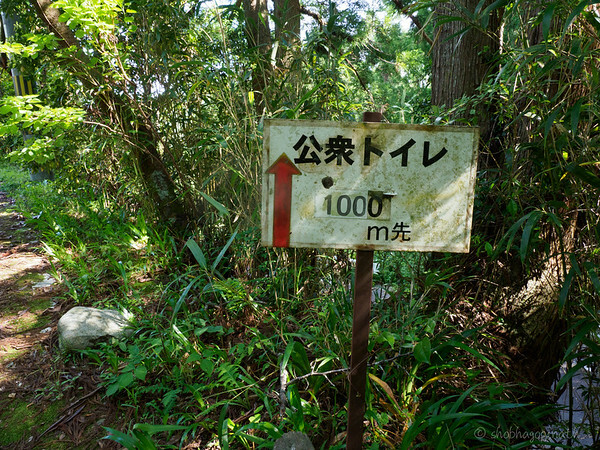 We then started our hike from the Hossimon-oji. After the ritual prayer at the shrine, we commenced our walk. The rain didn’t let up but we didn’t mind. Our only concern was to make sure we didn’t slip or fall while on the trail which was very slippery. A word about shoes. In that same poem by Clarke, he says “Convictions, directions, opinions, are of less importance than sensible shoes.” How true! And in the words of another hiker, “Bad shoes render everything else moot”. The most important thing on a trek are shoes. You don’t get that right – you can forget nature, your surroundings and your peace of mind. Folks who have worn incorrectly fitted shoes come back with severe blisters and bloody and blackened toes, barely able to hobble. The proper fitting of hiking boots/shoes is quite different from the fitting of normal shoes. Our hike today was largely a silent one. Listening to the rain. It was beautiful. It was meditative. I found myself very present. We trudged along until we reached the Fushiogami-Chaya – a teahouse up in the mountain which is run by volunteers. We sat down to our bento lunch and used the much needed toilet facilities. We were so impressed at the facilities in the mountains. There weren’t too many, but the two we came across on our walk were clean and even had soap. Honestly, the Japanese have taken the comfort of a lavatory to an insane level. Masters of creature comforts. More of this later. The little teahouse served much needed coffee. Nothing like a steaming cup of coffee on a cold rainy day. We rested up and chatted a while. There were other hikers taking shelter there, who had passed us earlier that morning. We were the slow coaches, stopping every little while to take photographs. 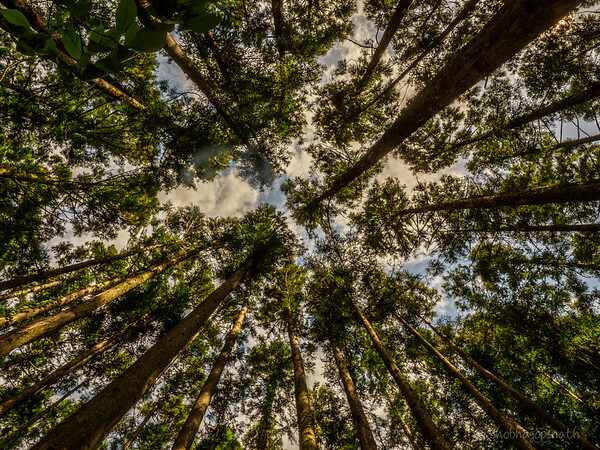 Waka, was very appreciative as she had begun to see the forest with a photographer’s eye. A different world opened up for her as she saw the way we observed things around us. We continued up the mountain after getting our booklet stamped. 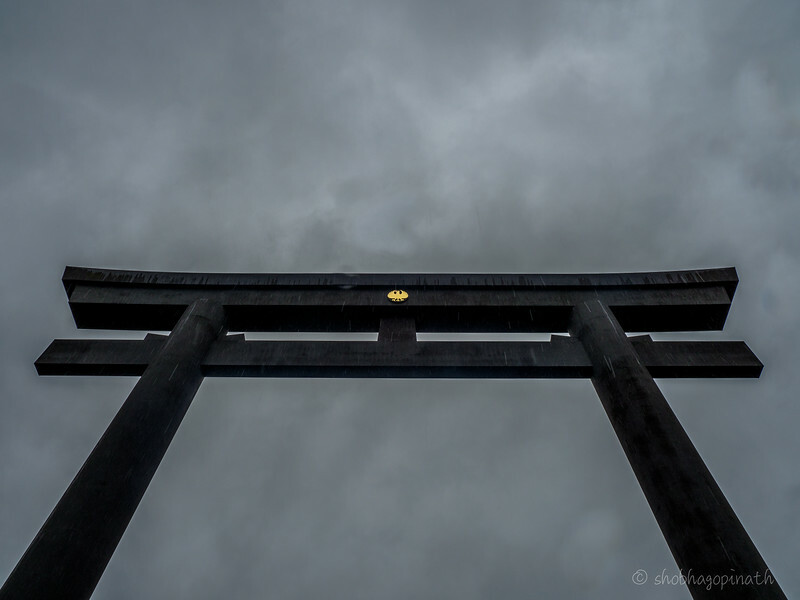 … and lo and behold the clouds parted and we caught a glimpse of the giant Otorii Gate of the Hongu Taisha – which was our destination for today. It was quite a dramatic view with mist and clouds rolling over the mountain top and it gladdened our hearts that we were able to see it. Waka proclaimed that the Kumano deities were kind to us because we have been respectful and always shown courtesy and kindness. It was such a lovely thing for her to say. What a sweet person. We backtracked to the main route. We met two groups of Japanese pilgrims, one was a group of elderly men and women. You could tell it was hard going for them, especially one old man and a companion who had fallen far back from their group. He was so tired and unsteady, we were so concerned that he would fall. He couldn’t take even one more step and sat heavily on a root of a tree. We stopped to help but he and his companion waved us along saying he’d be fine, just needed to catch his breath. As we passed the groups, there was much polite bowing and ‘konechiwas’ as we tried to manouever past them on the narrow path. We finally reached Hongu Taisha. 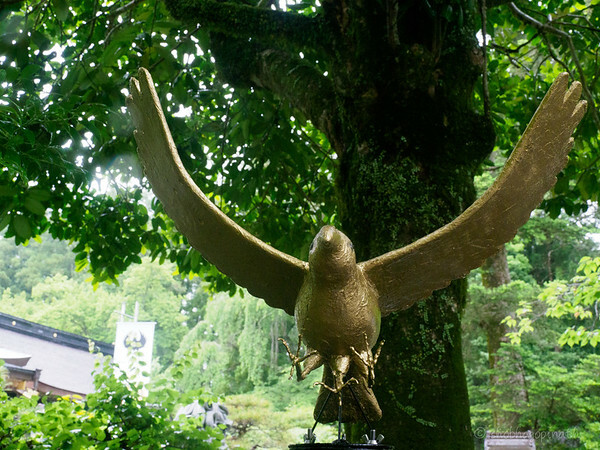 The three-legged crow – Yatagarasu had a prominent place in the grand shrine and it still has special significance in Japan today. We had seen symbols of it on our trek. The story is Emperor Jimmu migrated eastward looking for a better homeland and faced many tribal battles along the way and faced heavy losses, which he attributed to the fact that they were fighting facing eastwards, against the sun. He led his people around the Kii Peninsula, wanting to turn westward and got lost in the mountains of Kumano. The sun goddess, sent Yatagarasu to save and guide them to safety. Yatagarasu led them through the mountains to reach present day Nara, where Jimmu founded his capital and became Japan’s first Emperor. 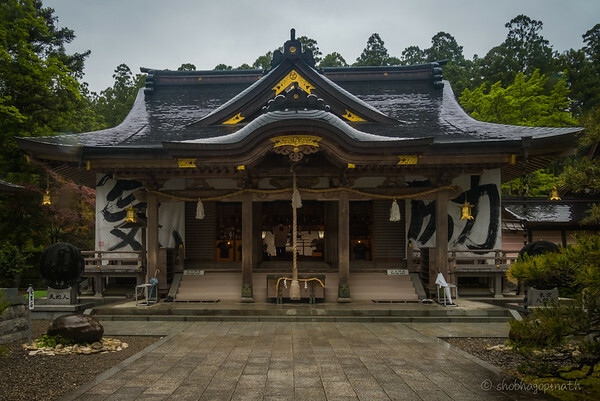 The Kumano deities are a family and all the grand shrines have individual shrines to the father, mother, son and daughter. At different locations, a different member of the family is the main deity. Here, the main deity was the son. As we got closer to the main shrine, I wasn’t sure if my eyes were playing tricks on me. 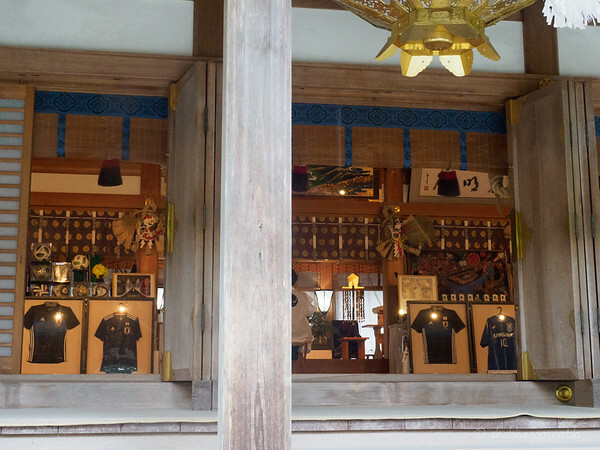 There were what looked like football jerseys framed and hung on the outer hall of the shrine. It was quite bizarre! Waka confirmed that they were indeed the football jerseys of the national team – to be prayed over for their success! :-) And by the way, Yatagarasu is the emblem of Japan’s football team. Look out for it during the World Cup! After our purification and prayer ritual, we walked down the steep staircase and found a cafe and decided we had to have another cup of coffee. Of course there were snacks to accompany the coffee too. While there, we walked into a nearby souvenir shop and we got to talking with the chap there with Waka translating. He had walked both the Camino in Spain and the Kumano. A dual pilgrim! He asked where we’re from and we chatted for a while. He took a liking to us and proceeded to give us a wooden Kumano keychain with Yatagarasu on it, for it to always serve as a guide. It was such an lovely and unexpected gesture. 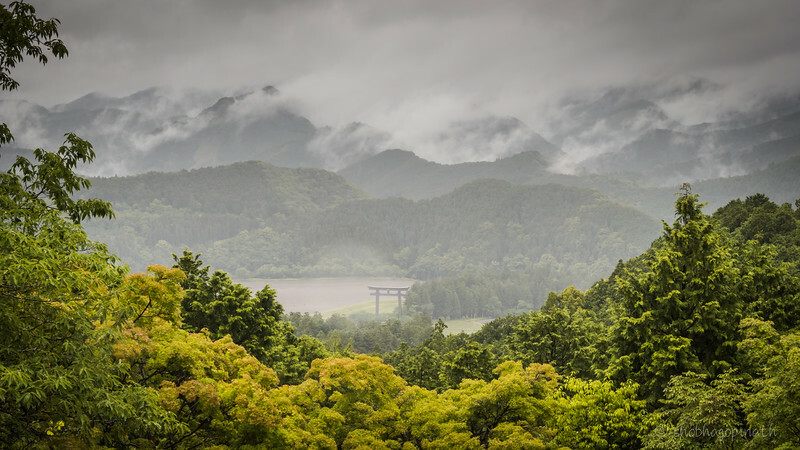 It was drizzling when we continued on our walk, to the giant Otorii (Big gate) that we saw from the mountain. It was huge – 33.9m tall and 42m wide (111.2 ft and 137.9ft). 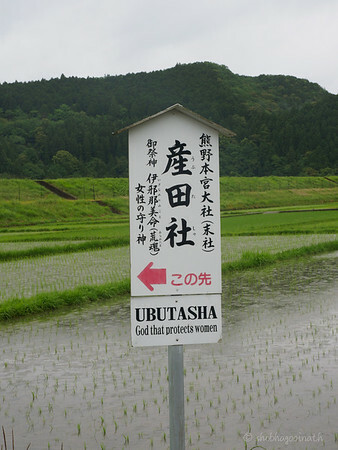 On the way we saw a sign in the paddy field with an arrow directing “God that Protects Women”. This got our curiosity piqued and we followed the sign to a little shrine. This was our last stop for today and we got a special stamp. It was the 2050th anniversary of the Hongu Taisha and for this year it was a special gold stamp. After another refreshing and relaxing bath, we went down for yet another elaborate and sumptuous dinner. This was getting to be too heavy for me. Is it possible to faint with the exhaustion of eating too much? My gourmet-loving sister had no such issues! Our morning onsen was becoming a ritual for us. 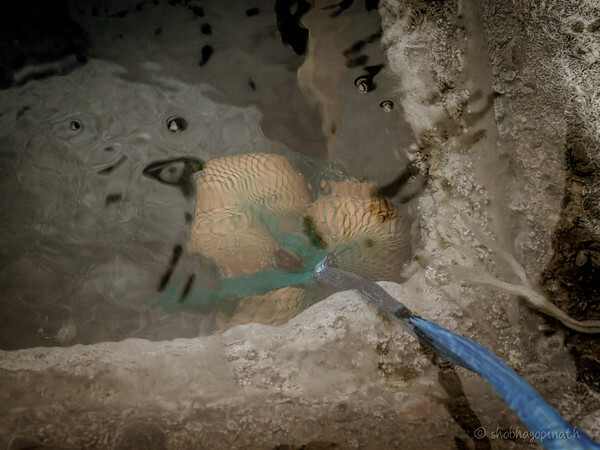 You really did feel the kinks and knots relax in the hot water. Today I opted for a Western breakfast of bread and eggs. I simply could not have another heavy breakfast of rice and dishes. We packed and checked out of our lovely ryokan and took a short drive to the Kumanogawa (Kumano River). Part of the Imperial Route involved a boat ride and we were on the same route. We were kitted out with life jackets and a hat. Today, unlike yesterday, was a hot hot day. Solar shirts and sunscreen were the order of the day. The boat ride was beautiful despite the searing and unrelenting sun beating down on us. The river guide, explained things and told stories as we cruised gently along. At one point, the engines were cut and she brought out her flute. 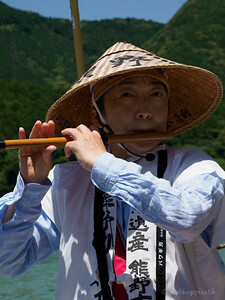 In the old days, there were only oars and there would be someone on the imperial boat playing the soothing flute. So they re-created it for us. With eyes closed, all you could hear as you swayed was the sound of the oar, the water lapping up against the boat, the birds above and the melodious flute. It was quite magical, as you felt as if you were being transported to another realm. We got off at a place called Shingu and found a small ramen place for lunch. Quite delicious it was – apparently the best ramen in town. We then went on to the Hayatama Taisha. 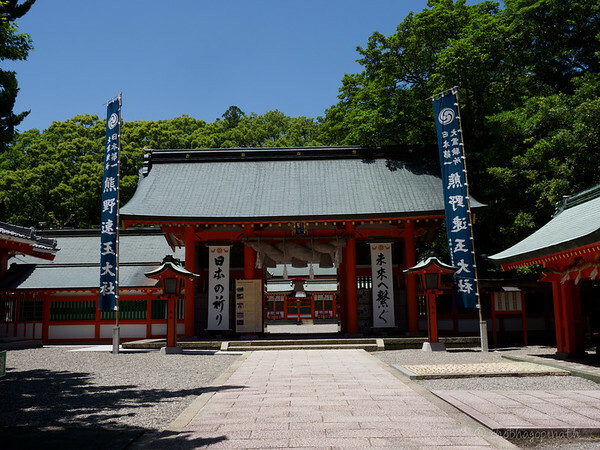 The Hayatama Taisha was the second of the three grand shrines. 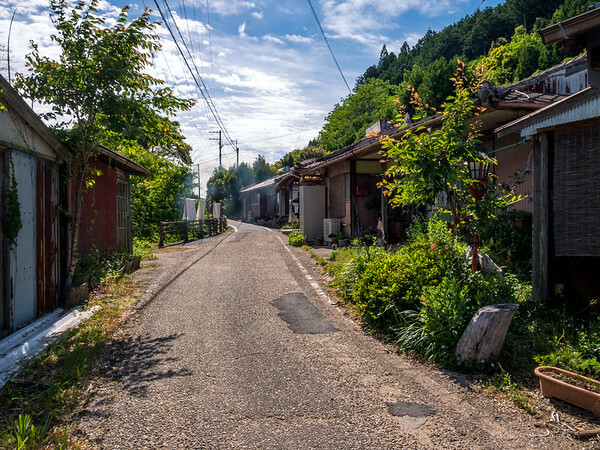 From there it was to the third and last grand shrine, Nachi. We trekked the long steps up to Nachi and the Segantoji temple. It was a fair way up. When we finally reached, both the grand shrine and the temple were under scaffolding for restoration works so we couldn’t see the outside properly. 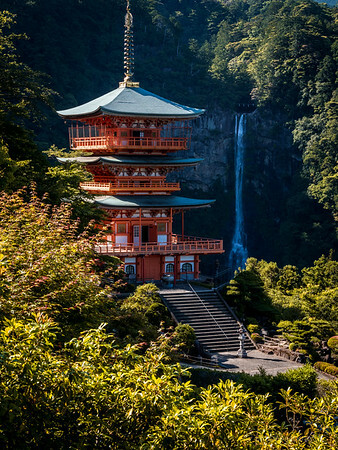 The trek didn’t end there, we walked on and came upon the view that’s on Kumano postcards and websites – that of the three-storied pagoda with the Nachi Falls in the background. Of course we took many photos from many angles. There was still more to hike and we made our final push to the Nachi Falls itself. It was a beautiful sight. We didn’t expect the trails to be so varied – cobble, mud, moss, roots, steep ascents, slippery descents, cool rivers, hot springs, rain, sun … but the constant was always the tranquility of the forest. What a fulfilling journey this has been. What made it so? The quiet of the forest? The serenity of the mountains? Connecting with my sister at a deeper level? Or was it the connection with myself? … all of it I suppose. 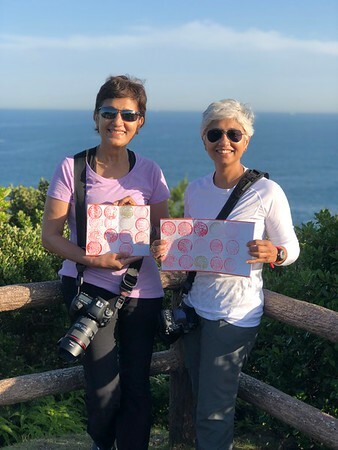 While we have got the official credentials to say we have completed the Nakahechi Route, it was a ‘technical’ completion in our minds as we didn’t hike the entire route (which would have taken 8-9 days). 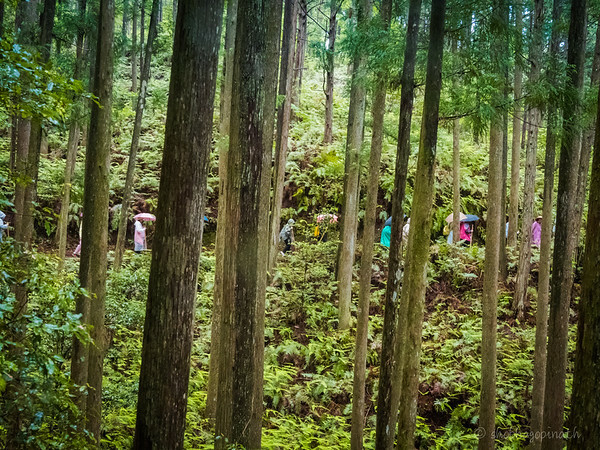 Perhaps the Kumano deities will bestow upon us the blessing of being able to do it again but the next time we hope to walk the entire route. We took a taxi from Nachi Falls and the driver suggested a scenic coastal drive to view the Pacific ocean. It was beautiful and we took in the ocean breeze from a look-out point. 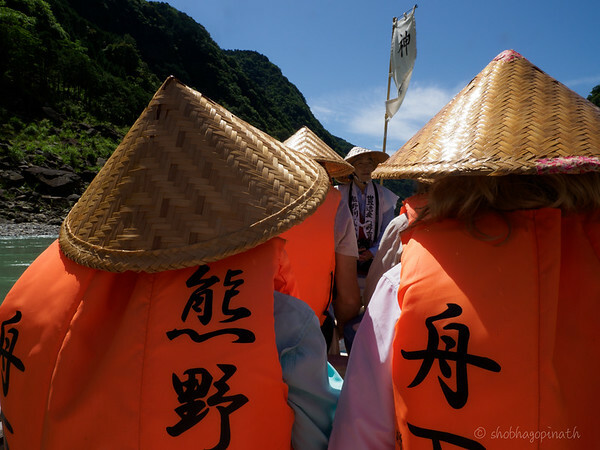 We then drove down to the coastal town of Nachi Kasura to get the boat shuttle to our hotel for the night. We felt an attachment to Waka and we were sad to say farewell to her and she felt likewise. The hotel was on a small island and famed for its onsen, especially their outdoor onsen. We were onsen-ed out and tired and so gave the outdoor onsen-with-a-view a miss. This was a regular ‘western-style room’ with a bathroom and shower in the room so we opted for the usual. Dinner was another elaborate affair with a set menu which even my gourmand sister struggled through. Our waitress didn’t speak English so a kind lady at the next table came to our rescue. The set menu was too extensive for us and we simply had to cut it down and that really confused our waitress. Why would you want less?? We chatted through the night, till one of us just dropped off to sleep mid-sentence. We were up early to get our boat shuttle to the shore and on from there to Kyoto, Hakone and Tokyo. We will miss the quiet of Wakayama, which now holds a special place for us. My sister and I enjoyed this hike tremendously and had so many special moments that will last forever. Hiking the Kumano Kodo was an intensely personal experience for us, the shared experience a tie that binds us ever closer. June 14, 2018 in Japan. 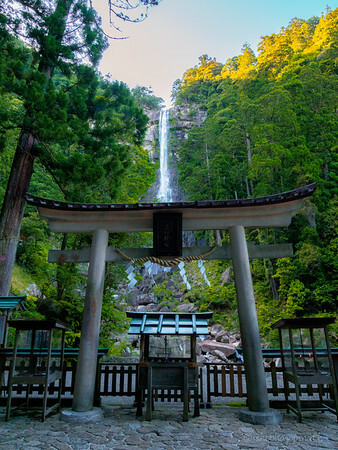 Thank you so much for sharing your beautiful experience on the Kumano Kodo. My husband and I are walking the Camino de Santiago in October, and we would like to walk the Kumano Kodo in a year to become dual pilgrims. I really enjoyed reading your narrative and seeing your photos! Could you let me know which company you used to hire your guide? Thank you. God bless. Thank you so much. I hope to walk the Camino too! I went through an agent in my country but you may write directly to the Wakayama Prefecture tourism board. They will assign the guide and assist with accommodation too. I am travelling at the moment and will not have Wi-Fi most of the time. So pardon me if you don’t hear from me. Good luck with the Camino, I’m sure it’ll be fabulous! Thank you so much for this blog. Only when I got this mail did I realise that there was a part 1. So I went back to part 1 to finish reading that before moving on to the second. It was truly an amazing experience being part of your journey. I experienced your calm, the silence around, the comraderie, the company of Waka and also the soothing healing touch of the Onsen. I know that such a trek would be impossible for me and so thank you for making it possible. I may never get stamped but I feel I have already undertaken this trek. Loved every bit of it. 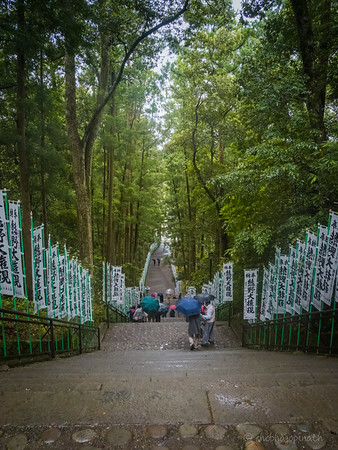 The photos actually transcended me through Kumano Kodo! You are a star and Kanako is absolutely right about your writing prowess ! Your writing is as beautiful as your photos! I am so happy to read the whole journey seem to went great. I felt like I was travelling with you as I was reading your journal! Thank you Kanako! You made Mt Koya special for us!